Handy, take-apart lifts let you stow small scooters in your trunk. The Bruno Space-Saver lift, meant for smaller vehicle openings, lifts and stores your smaller scooter or travel powerchair into vehicles with the touch of a button. Assemble the lift, connect the docking device, push a button, and let your Space-Saver do the lifting for you! 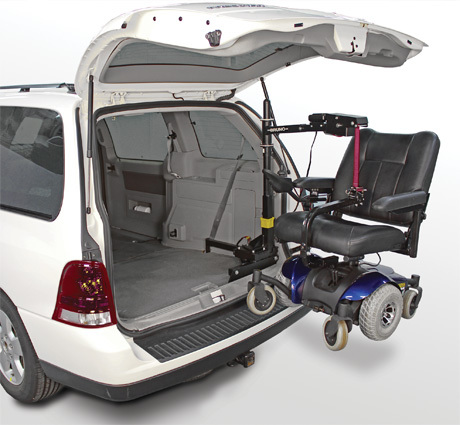 This lift features a variety of options such as Exterior Mount and Offset Arm, allowing you to more easily position your Personal Mobility Device inside your vehicle. Power Raise and Manual Rotate Operation. Lift can be disassembled when not needed. Docking device or Adjustable C-Arm included (at no charge). Optional: Hundreds of vehicle-specific Custom Bases are available for a precise installation. Optional Exterior Hitch Mount is available to maximize interior Mobility Device stowage space (good for smaller openings).